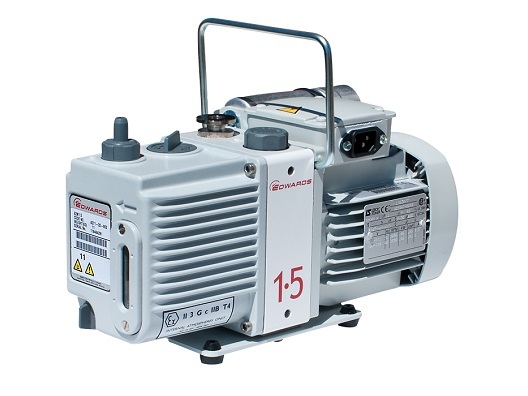 We typically have used and reconditioned pumps in stock from leading manufacturers like Cole-Palmer and Watson/Marlow. 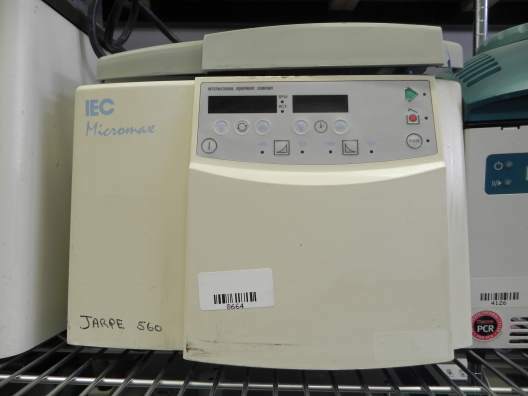 The Thermo IEC Model K floor model centrifuge is a high-capacity, heavy-duty, reliable machine – built like a tank and nearly as sturdy, this centrifuge can take a beating and keep on ticking. (Although we don’t recommend actually beating any of your lab equipment.) The Model K features a time, four swivel casters for easy maneuverability, a dynamic electrical braking system, and a timer allowing for 2 to 120 minute timed runs as well as an unlimited run time option. 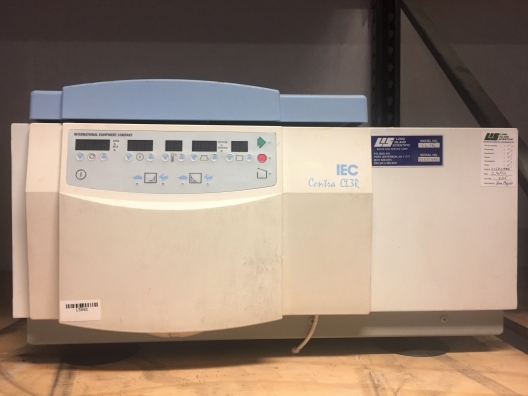 The Model K has a speed range up to 5,500 rpm depending on rotor selection, generating a force of 4,420 x G.
The Thermo IEC Centra CL3R is a large capacity refrigerated centrifuges used for a wide range of everyday lab processes. 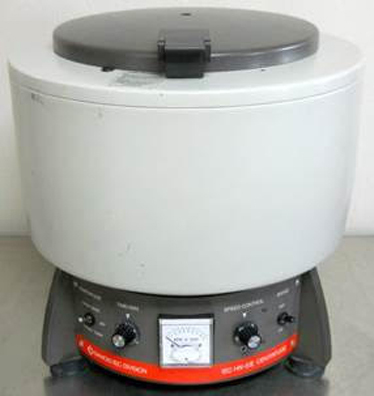 This benchtop centrifuge combines performance and safety all in one compact design. The instrument operates off of a whisper quiet motor and uses intuitive microprocessor controls to set up runs. The Thermo Centra CL3R centrifuge comes equipped with a four place swinging bucket rotor used for spinning larger capacity samples. The instrument allows you to program up to 99 different protocols allowing you to increase productivity. The centrifuge is widely used in clinical labs throughout the world, but can seamlessly work in any research and development laboratory as well. 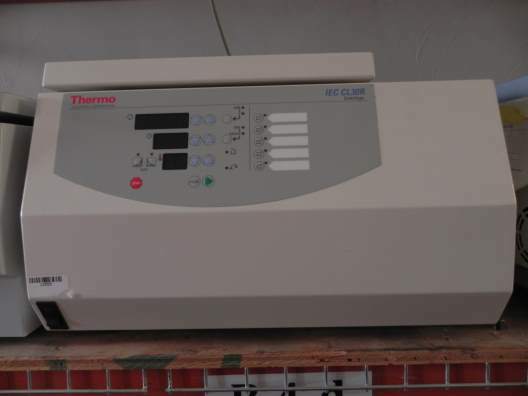 Moreover, the Thermo IEC Centra CL3R is ideal for tissue culture, cell culture, clinical testing and research applications. The IEC HN-SII is a centrifuge that offers superior performance to satisfy all centrifugal testing needs. Virtually a standard in every laboratory in the world, the IEC HN-SII has proven reliability and unparalleled versatility making it the best value available for routine bench centrifugation. Electric Time: 2 to 60 min. 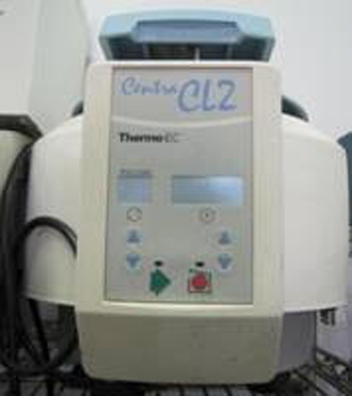 Thermo Scientific IEC CL30 bench top centrifuge. Features a microprocessor control, digital display, and Auto-Lock rotor exchange system which allows you to swap rotors in seconds. Speed: 500-16800 rpm by 50 rpm, repeatability to ±20 rpm. Force: 50-30600 xg by 50 xg. Timer: Auto-Reset, 1 sec to 99hr 59 min 59 sec. Computer Interface: RS-232 port, Run control/monitoring. Temperature (RF): -9C to +40C by 1C display range, +/-2C (+4C to +22C) control range. 99 Programs: 98 User input with Save/Lock, 1 Quick cooling/warming. Accel: Fast, Slow, User Input. Decel: Fast, Slow, User Input. Heat output: 4200 BTU/hour, 1230 watts/hour. Diagnostics: Imbalance, No rotor, Lid open, Tach/Refrigeration/Power failure. Includes Thermo IEC 8947 swinging bucket rotor: 4 x 250ML, Max Speed 5100RPM or 5100grams, computer interface for run control/ monitoring, fits 31" wide space. Ideal workhorse for the lab, featuring easy-to-use control knobs, and digital display of time and speed/g-force. Separate single-turn speed control and on/off switch with green power indicator—maintain speed setting while turning pump on/off. The 1/20-hp unidirectional motor (counterclockwise) has soft start and back EMF for ±5% speed control. Stackable painted steel housing is IP22 rated for protection from vertically falling water. 115 VAC models are UL and cUL listed; 230 VAC models are CE marked in compliance with European Community standards. 6-ft (1.8-m) line cord; 115 VAC: U.S. standard plug; 230 VAC: IEC 320/CEE22 socket—pumps are shipped with cord/plug set specific to destination country. The EM range of oil-sealed rotary pumps is renowned for their high ultimate vacuum, rapid pumping speed, quiet operation and the ability to withstand vapour. They are commonly used for laboratory and light industrial applications. It is a freestanding instrument with the drive provided through a flexible coupling by either a single phase or three phase motor. Thermal overload device: prevents overheating (single phase only). The drive is provided through a flexible coupling: by a singleâ€‘phase or threeâ€‘phase (four pole) motor. The motors: are totally enclosed and are cooled by the motor cooling fan. Full height O ring sealed oil sight glass: for easy checking of oil level and condition. 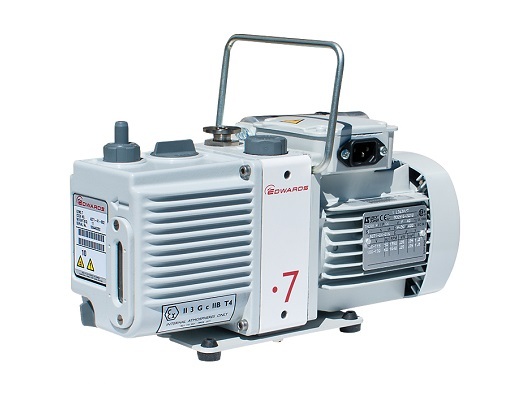 The Edwards E2M0.7 is a two stage oil sealed rotary vane pump which has a pressurized oil system that lubricates the pump shaft bearing surfaces and rotor sealing faces. This pump has an oil distribution valve that prevents any oil discharge to the pump interior(suckback) after the pump stops. It is equipped with air-tight pumping chambers, which prevents oil suckback unless the gas ballast valve is open. Low energy consumption: 0.09 kW. O ring sealed sight glass: allows visual inspection of oil level and condition. Gas ballast valve: for large water vapour handling capacity. Forced air cooling: ensures low pump surface temperature. 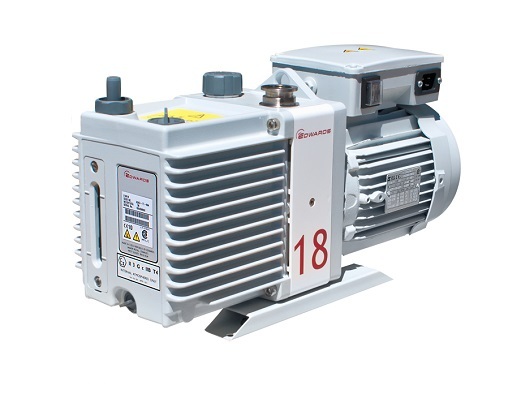 The Edwards E2M1.5 is a two stage oil sealed rotary vane pump which has a pressurized oil system that lubricates the pump shaft bearing surfaces and rotor sealing faces. This pump has an oil distribution valve that prevents any oil discharge to the pump interior(suckback) after the pump stops. It is equipped with air-tight pumping chambers, which prevents oil suckback unless the gas ballast valve is open.